Order your print or electronic copy from New Society Publishers today! Commoning was a way of life for most of our ancestors. In Reclaiming the Commons for the Common Good, author Heather Menzies journeys to her roots in the Scottish Highlands, where her family lived in direct relation with the land since before recorded time. Beginning with an intimate account of unearthing the heritage of the commons and the real tragedy of its loss, Menzies offers a detailed description of the self-organizing, self-governing and self-informing principles of this nearly forgotten way of life, including its spiritual practices and traditions. She then identifies pivotal commons practices that could be usefully revived today. A final ‘manifesto’ section pulls these facets together into a unified vision for reclaiming the commons, drawing a number of current popular initiatives into the commons and commoning frame – such as local food security, permaculture and the Occupy Movement. 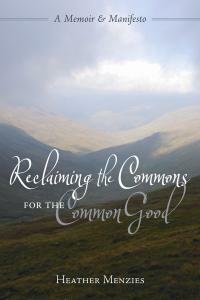 An engaging memoir of personal and political discovery, Reclaiming the Commons for the Common Good combines moving reflections on our common heritage with a contemporary call to action, individually and collectively, locally and globally. Readers will be inspired by the book’s vision of reviving the commons ethos of empathy and mutual respect, and energized by her practical suggestions for connecting people and place for the common good. I also prize my Scottish ancestry, and have plumbed its mighty depths for ideas and images in my art work for over 3 decades. I would love to purchase this book: is it available on line here or somewhere? It explores ideas very close to my wee heart!